I mentioned a few posts back that I had the belly of one side of our pig left whole, so I could try my hand at making bacon. Finally, I can report on the results! 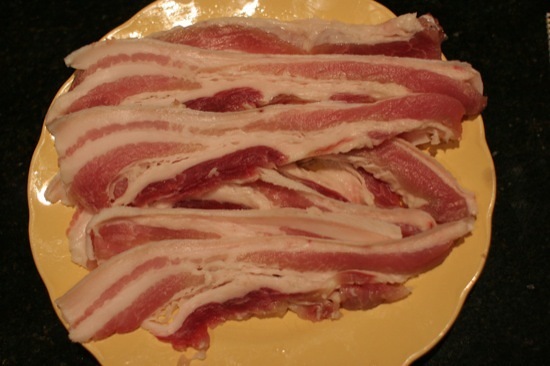 Bacon made from the belly is typical in the US, but elsewhere is often referred to as “streaky bacon” (especially in English recipes) or “American-style bacon”. I read a number of recipes online, and decided to go for something that didn’t require smoking. Mostly because I don’t have a smoker :-). 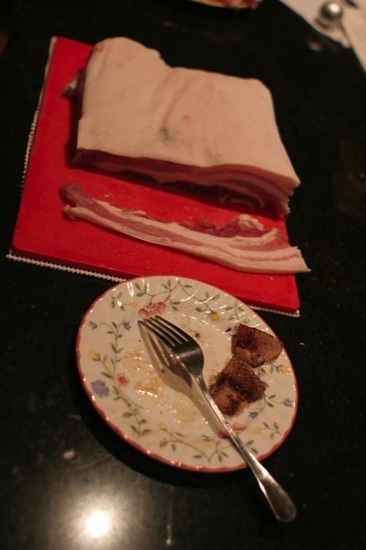 In the end, I chose a fairly simple wet-cure bacon recipe I found over at The Cottage Smallholder. I did two batches – one with maple syrup instead of treacle, and the other with golden syrup. Mostly because I didn’t have any treacle or molasses :-). The bacon sits in the salty/sweet brine for 4 days in the fridge. It was still fairly soft when I took it out – a bit like pickled pork. I thought it’d be firmer, but then I’ve never done this before. A wet-cured bacon isn’t going to last as long in the fridge as a dry-cured smoked bacon, so I decided to slice it up and freeze it in useful-sized batches. 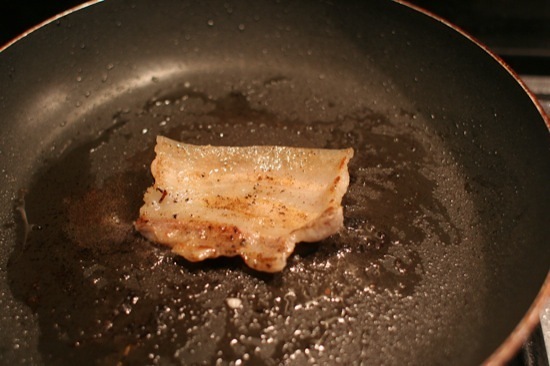 Of course, I had to fry up a few slices just to see how it turned out. It was great! Salty, very slightly sweet, and absolutely delicious. Next time I think I’ll try harder to find molasses, and see if it turns out any different. I’ll also definitely try a dry cure, and maybe even rig up a smoker and go the whole hog. Pardon the pun :-). Have you ever tried curing bacon or ham? Any tips to share? Molasses isn’t hard to find – horses love it. Get mine at Poplars Produce at Kembla Grange. I make various garden tonics out of it myself. @Meryl: Yep, I’ve got some molasses from a feed store which I use for the garden. I wasn’t sure if it was OK for human consumption, though, and especially for preserving meat, so I didn’t risk it. @Anna: Thanks for the link – I’m checking the site out now. That is the style of cure I want to try next, so I’ll save the link for later reference. Great work darren – Hugh would be proud!!! @Donna: Haha! He’s probably got to shoulder most of the blame for me even attempting this! @Darren I’ve been thinking about it and I think if the curing process is sufficient to deal with anything raw pork has to offer, I’d say the molasses would pose very little risk. You might ask them to open a new container if you’re really worried. Otherwise I’m not sure of a human food source (ie comes in a jar). Maybe manic organic or another wholefoods specialist. @Meryl: It probably would have been OK, but I didn’t want to do anything risky with this bacon, being the culmination of so much effort! I have seen it in a supermarket before – and it’s nowhere near as cheap as the feed store stuff. Probably comes from the same factory, too :-). Delighted that my recipe worked out well for you! If you can’t find molasses black treacle is the same (almost!). @Cottage Smallholder: Thanks for stopping by! Yes, I’m very happy with your recipe – it was so easy and low-fuss. Neither molasses nor black treacle are very common here in Australia, but I’m sure I’ll be able to dig some up for next time.